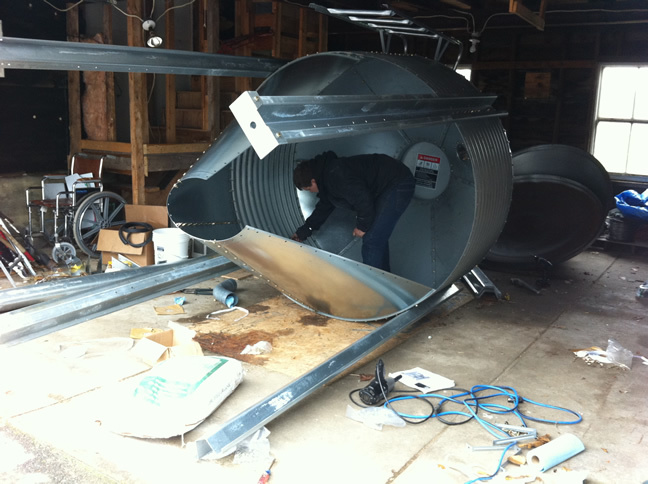 Shea Vaccaro and I have spent the past few days assembling this giant tin can in the garage. Whenever I see one of these things on a farm that ostensibly raises grass-fed beef, I question the farmer what it is for (and so should you). Steve will tell you it is our tribute to the anniversary of Yuri Gagarin’s historic space flight. But in reality, it is a bulk grain storage bin. Some farmers use them to store grain for their cattle. In our case, it will hold organic chicken feed for our broilers. We can save over 20% of the cost of feed by buying in bulk, rather than in bags.